Earlier this month (June) Chuck and I took a just-for-the-heck-of-it trip to New Orleans, a city he had never visited. I say just for the heck of it, but actually it was because we had a companion pass on Delta that we needed to use by a certain date and were running out of time, so. The companion pass was a “benefit” of our Delta American Express card, which we originally got when we went to the Galapagos so we could benefit from all the bonus signup miles and the perks of the card (free bags, priority boarding). Last year I called to cancel the card and they sold me on their platinum card which had twice the annual fee (from $95 to $195) BUT came with the companion pass (buy one regular fare domestically and get a companion pass for free!) plus the perks we had before as well as some new ones like access to Delta lounges at airports. It seemed like a good deal so I signed up. What I didn’t realize was that there were a lot of restrictions on the use of said pass – only certain classes of economy, no upgrades to premium economy, etc – and it MUST be used each year before your renewal date, etc. We wanted to take a trip somewhere far enough that the companion pass would pay for the card’s annual fee, and New Orleans fit the bill. All in all, though, now that we’ve used the companion pass we’re going to cancel the card – that annual fee is just too high and we don’t fly Delta enough to make it REALLY pay for itself. The flight to New Orleans was fine, although our original plane broke and they had to fly in a replacement plane from Salt Lake City that led to a 3 1/2 hour delay (but everybody was very nice about it – I haven’t heard that many apologies in a long time and they were willing to rebook people on another airline if they had connections that they couldn’t miss). Our replacement plane was okay – other than being ancient. Mostly we were happy that it worked (you know, took off and stayed in the air) and flew us safely to our destination. 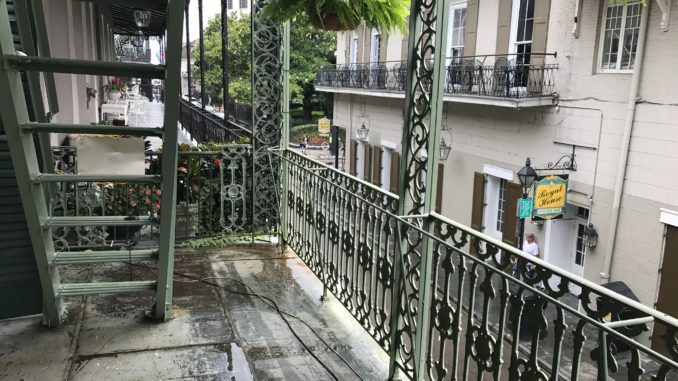 ANYway, we stayed at the Royal Sonesta, a lovely hotel right on Bourbon Street in the French Quarter – we couldn’t have been more centrally located. Our room was very comfortable and looked out over the courtyard (versus Bourbon Street) so was quiet and peaceful. We got the room for an amazingly low rate, due I think to the time of year and the fact that there is a massive infrastructure project happening on Bourbon Street – they are replacing the water and sewer lines. So our room can run as high as $350, and we got it for $119/night. The hotel had a lovely restaurant/bar attached called the Desire Oyster Bar and at happy hour they served oysters for $1/piece. Chuck loves oysters and so we took advantage of this great deal a few times and learned about charbroiled oysters – deliciously cooked in garlic and butter. Yum! On the food front we tried to sample as many New Orleans specialties as possible – etouffe, muffuletta, gumbo, jambalaya – the only thing we never got around to trying were hurricanes, which you see people walking around with in plastic, well, test tube-looking glasses all the time. the whole booze thing in New Orleans really is something else – there are a LOT of bars there and people get pretty tipsy pretty much all day long! I actually mistook a daiquiri bar for a yogurt store (a la Pinkberry) – they had these stations where you hold your cup/glass under the spigot – only instead of yogurt coming out, frozen drinks came out. Crazy! But the very best meal we had was lunch at Antoine’s, which has been a landmark in the French Quarter since 1840. It’s a pretty fancy place, but happily for us they had an amazing lunch deal – $20.17/person for a three course menu that included up to three cocktails for 25 cents/piece. The food was absolutely sensational and after lunch we go a guided tour of the restaurant which was a real treat. All sorts of famous folk have dined there over the years, and it houses a great collection of Mardi Gras memorabilia. All in all, a highlight of our trip! Since it was Chuck’s first time there, we did a lot of tours. We started with a historical/architectural tour of the French Quarter and used the Friends of the Cabildo Walking Tours. It was raining that day, so Chuck and I were the only ones on the tour which allowed us to go at our own pace and ask lots of questions. We learned a lot about the checkered colonial history of the city, the various people who made New Orleans their home, and the differences between a galley and a balcony, among a bunch of other stuff. An excellent two-hour investment! We also did a cemetery tour of St. Louis Cemetery #1, which now requires you have a tour guide. We went with saveourcemeteries.org, another non-profit that puts the tour proceeds back into maintaining the cemeteries of New Orleans (a somewhat Sisyphean task from the looks of things). The last time I did a cemetery tour it was more of a show – the guide dressed up and told stories. This tour was more reality-based – so more informative but a bit less entertaining. We also visited the Presbytere which houses a wonderful and heartbreaking exhibit about Hurricane Katrina. We also crammed in a self-guided walking tour of the Garden District and Frenchmen Street and hit Preservation Hall one evening for some real deal jazz. And of course we also went (twice) to Cafe du Mond to nosh on beignets. The big miss: we ran out of time to do a swamp/bayou tour. Next time, I guess!